By: Satya Prakash Mohanty , a renowned teacher, has had a brilliant academic record. An assistant professor of chemistry, he did his masters and doctorate degrees in chemistry. Having over three decades of professional standing, he is associated with various pedagogical institutes. He has guided m... View More Satya Prakash Mohanty , a renowned teacher, has had a brilliant academic record. An assistant professor of chemistry, he did his masters and doctorate degrees in chemistry. Having over three decades of professional standing, he is associated with various pedagogical institutes. He has guided many research students for their doctorate degree. Dr. Mohanty is widely travelled and is committed to the cause of excellence in teaching of chemistry. He has organised many national as well as international seminars, symposia, workshops and congresses and has been honoured widely for his significant academic contributions. An illustrations educationist, he contributed many scholarly papers on national and international journals, magazines etc. Sushil Chauhan did his M.Sc and is Ph.D in chemistry. His areas of interest are organic synthesis, stereochemistry, organic reaction chemistry and organometallics. For the last twenty years, he has been teaching chemistry to graduate and undergraduate students. He is an advisor to many industrial organisations and is associated with many academic institutions in India and abroad. Dr. Chauhan started his career as a lecturer in a local college in 1985. Since then he is engaged in teaching and research activities. He has guided many research students for their doctorate degree. He is a contributing editor to many science magazine and a columnist to many professional journals of repute. He has also authored many outstanding books on organic biochemistry. About the author: Satya Prakash Mohanty , a renowned teacher, has had a brilliant academic record. An assistant professor of chemistry, he did his masters and doctorate degrees in chemistry. Having over three decades of professional standing, he is associated with various pedagogical institutes. He has guided m... View More Satya Prakash Mohanty , a renowned teacher, has had a brilliant academic record. An assistant professor of chemistry, he did his masters and doctorate degrees in chemistry. Having over three decades of professional standing, he is associated with various pedagogical institutes. He has guided many research students for their doctorate degree. Dr. Mohanty is widely travelled and is committed to the cause of excellence in teaching of chemistry. He has organised many national as well as international seminars, symposia, workshops and congresses and has been honoured widely for his significant academic contributions. An illustrations educationist, he contributed many scholarly papers on national and international journals, magazines etc. Sushil Chauhan did his M.Sc and is Ph.D in chemistry. His areas of interest are organic synthesis, stereochemistry, organic reaction chemistry and organometallics. For the last twenty years, he has been teaching chemistry to graduate and undergraduate students. He is an advisor to many industrial organisations and is associated with many academic institutions in India and abroad. Dr. Chauhan started his career as a lecturer in a local college in 1985. Since then he is engaged in teaching and research activities. He has guided many research students for their doctorate degree. He is a contributing editor to many science magazine and a columnist to many professional journals of repute. He has also authored many outstanding books on organic biochemistry. 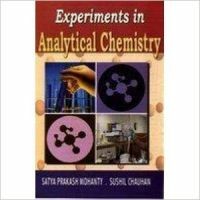 Other books by Satya Prakash Mohanty , a renowned teacher, has had a brilliant academic record. An assistant professor of chemistry, he did his masters and doctorate degrees in chemistry. Having over three decades of professional standing, he is associated with various pedagogical institutes. He has guided m... View More Satya Prakash Mohanty , a renowned teacher, has had a brilliant academic record. An assistant professor of chemistry, he did his masters and doctorate degrees in chemistry. Having over three decades of professional standing, he is associated with various pedagogical institutes. He has guided many research students for their doctorate degree. Dr. Mohanty is widely travelled and is committed to the cause of excellence in teaching of chemistry. He has organised many national as well as international seminars, symposia, workshops and congresses and has been honoured widely for his significant academic contributions. An illustrations educationist, he contributed many scholarly papers on national and international journals, magazines etc. Sushil Chauhan did his M.Sc and is Ph.D in chemistry. His areas of interest are organic synthesis, stereochemistry, organic reaction chemistry and organometallics. For the last twenty years, he has been teaching chemistry to graduate and undergraduate students. He is an advisor to many industrial organisations and is associated with many academic institutions in India and abroad. Dr. Chauhan started his career as a lecturer in a local college in 1985. Since then he is engaged in teaching and research activities. He has guided many research students for their doctorate degree. He is a contributing editor to many science magazine and a columnist to many professional journals of repute. He has also authored many outstanding books on organic biochemistry. by P N Prasad, born and brought up in Patna, Bihar, is a famous environmentalist and a seasoned teacher. He has had a brilliant academic record. He completed his B.Sc. (Zoology) with a first division and M.Sc. (Botany) also with a first division. He teaches and does research in molecular biolog... View More P N Prasad, born and brought up in Patna, Bihar, is a famous environmentalist and a seasoned teacher. He has had a brilliant academic record. He completed his B.Sc. (Zoology) with a first division and M.Sc. (Botany) also with a first division. He teaches and does research in molecular biology, biochemistry and environmental science. He has worked as editor-in-chief in some leading journals of biotechnology and environmental science and consults for several biotechnology companies. He has published many research papers in professional journals of repute and about five outstanding books. T R Amarnath, a renowned educationist, a seasoned teacher-trainer and a well-known environmentalist, has had a brilliant academic record. He has over three decades of professional standing. He has worked with various pedagogical institutes and has participated in many national and international conferences. He is author of many books on science and environmental education, and is a leader in the development of constructivist-based teacher educatin programmes and professional development seminars for teachers of science. He is widely travelled and is committed to the protection of the planet Earth.